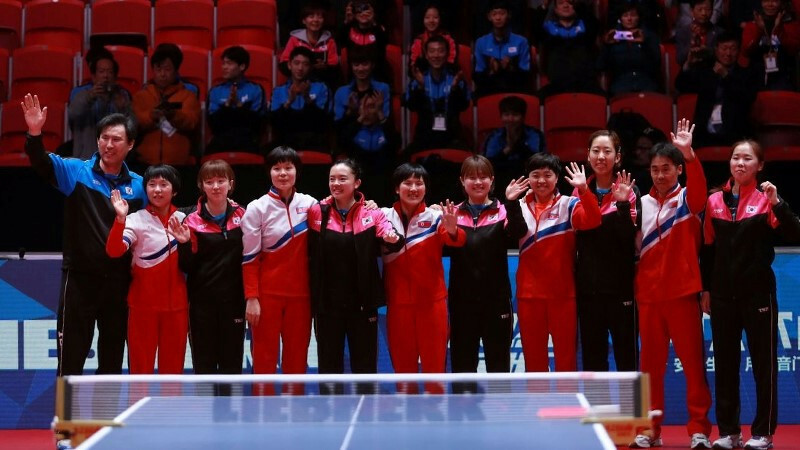 North and South Korea refused to compete against each other at the World Team Table Tennis Championships in Halmstad, with the International Table Tennis Federation (ITTF) allowing them to form a unified team midway through the competition. The two teams were set to clash in the quarter-finals of the women's tournament in Sweden, following North Korea’s 3-0 win over Russia in the last 16. South Korea had earned a place in the last four by topping Group D earlier in the competition. The ITTF state that both teams told the umpires that they did not want to compete on the table against each other when they walked into the court. A request was made to form a unified Korean Team to compete together in the semi-final, where they will take on either Japan or Ukraine. It was claimed the decision for the unified team was a tripartite one between the leaders of the North and South Korean Table Tennis teams and the ITTF, with the governing body’s President Thomas Weikert giving the idea his support. “When I informed the Board of Directors about this development, the unified team received a standing ovation from the delegates who showed their sign of support to this historic move,” he said. The last time that a unified Korea team played the World Table Tennis Championships was 1991 in Chiba, where they beat defending champions China to win the title. The latest decision follows the historic summit between Kim Jong-un and Moon Jae-in, supreme leader and President of North and South Korea respectively. The summit was held in the truce village of Panmunjom, were they reaffirmed their commitment to "complete denuclearisation". Kim and Moon pledged to gradually reduce weapons on both sides, and to push towards turning the armistice that ended the Korean War in 1953 into a peace treaty this year. It was only the third such meeting between the leaders of the North and South. Yesterday, the International Olympic Committee (IOC) announced a new programme to additional support to North Korean athletes competing at major events. The IOC are continuing to try to cash-in on the participation of North Korean athletes alongside those from the South at the Winter Olympic Games in Pyeongchang in February. North Korea athletes marched alongside those from the South at the Pyeongchang 2018 Opening Ceremony and, for the first time ever, they played side-by-side as part of a unified Korean women's ice hockey team. Support provided by Olympic Solidarity for a 12-strong North Korean team at the current World Table Tennis Championships in Halmstad was described as a "blueprint". "This is a big historical decision for both our countries,” said Ryu Seungmin, Korea Table Tennis Association vice-president and IOC member. “This is table tennis history so we are very happy. “I would like to thank the ITTF for their strong support. “This is an important statement to promote peace between our countries through table tennis." President of the Table Tennis Association of the North Korea, Ju Jong Chol, added “This is the result of the strong support provided by the ITTF and IOC. It is not the first case of "Ping Pong Diplomacy", with the United States team having visited China in 1971, following the World Table Tennis Championships in Japan. The move was viewed as helping to boost relations between the two countries. Japan and Ukraine will have to contest their quarter-final match today, while China will meet Austria. The winners of that contest will take on either Hong Kong or Romania in the last four. The round of 16 in the men’s tournament will also take place today.